Looking for an effortless way to secure your data while taking advantage of the fastest USB 3.0 speeds? Look no further than the diskAshur, a hardware encrypted portable Hard Drive by iStorage. 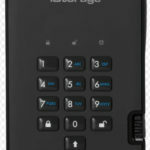 With an easy-to-use keypad design and software free setup, the iStorage diskAshur enables you to securely access the drive with your own unique PIN on any operating system including embedded systems and now with super-fast data transfer speeds up to 5 Gbps and capacities up to 2TB. With no software installation required for setup or operation and the ability to run on any platform, the iStorage diskAshur provides stress free deployment in corporate environments. The iStorage diskAshur can be configured with independent Admin and User PINs. The Administrator Feature allows enrolment of up to five unique User ID’s and one Administrator. If the user forgets their PIN, the drive can be unlocked using the Admin PIN. Protection against hacker attempts doesn’t stop with Brute Force. Incorporated into the iStorage diskAshur’s electronics is iStorage’s Variable Time Circuit (VTC) technology, working to thwart “timing attacks” aimed at accessing the drive by studying the behaviour and infiltrating the diskAshur’s electronics. The iStorage diskAshur’s low powered design is perfect for using with notebooks and taking your data on the road. Perfectly pocketable, the diskAshur’s compact, robust design features a 16-point omni-directional shock mounting system and rubberised paint, protecting the drive from drops and knocks. The convenient integrated USB 3.0 cable eliminates the need to carry around cords with you and allows you to be connected at the flick of a fingertip.